Thank you all for the nice comments on my previous post! One thing which was mentioned (not for the first time) was the lack of detailed pictures and the fact that the pictures which are there can't be enlarged. That last thing is not on purpose. I would have sworn it was possible to enlarge the pictures of my first few posts, and I haven't changed anything in the blog profile... If any of you are blogger-wizzes and could help me out, it would be very much appreciated! The first thing, however, that's just me being a bit lazy, I guess. I use a self-timer to take those pictures, so detail shots of the clothes when worn are almost impossible. I will try and be better at taking some with items on my dummy or lying flat. For now, please enjoy a close-up of the painted birds and one of the single welt pockets. PS. I'll be trying out some of you advice on hair styles (those which don't require mad skills at hairdressing with handicap). I'm sporting a low braid right now. Thanks! Outside, it's definately spring now, we've already had some great weather but even within the span of one day, temperatures can vary quite a bit. So, what to wear? The lazy answer would of course be: jeans and a t-shirt. It is kind of with that thought that show you my latest creations here. 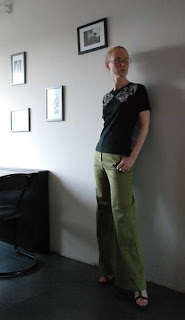 Trousers made from firm stretch cotton, and a refashioned t-shirt. Not the most exciting items, but very likely to become wardrobe staples. I bought the fabric for the trousers when I was looking for something cheap to make muslins. One of the fabric stalls at the market was having a sale: everything on the sale-table was 0,50 euros a meter. So, knowing this stuff had the right stretch for a muslin of V's dress, I bought what was left on the bolt. I actually went home with 14 meters of fabric on that day. 14 meters of nice fabrics which cost me all of 7 euros... You will see other fabrics from this haul show up in the future (although some were rather winter-y, so those may take their time). The pattern is my self-drafted, tried-and-tested flared trouser pattern. Third time I made it, and no real changes. 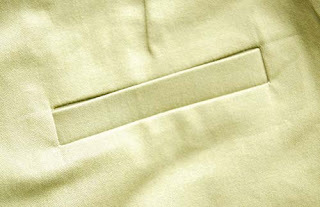 Scoop pockets at front, single welts at the back, fits at the natural waist and flared from mid-thigh. The t-shirt was one of two which I bought (for 1 euro each) at a second hand stall at the market. When you buy jersey from the bolt, it's usually thinner than the standard t-shirt stuff. Or, when you've been looking for something thicker, it's actually very densely knit. 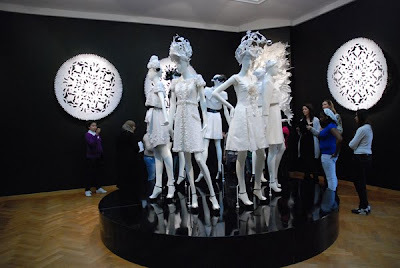 So, buying t-shirts for refashioning is not such a strange move as it may seem to be. These were 'deadstock' by the way, no signs of wear, about 12 similar ones (most of them blue though) on the rail, some still with tags. This one of a medium, so a bit big and too shapeless to my taste. I just took it in at the sides. Then, it was time for the fun part: decoration. I've wanted to make a t-shirt with a bird print for quite a while now, but it was hard to figure out a nice, pretty and interesting way of doing that. 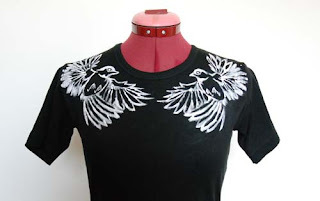 In this way, I like how the birds form a neckline-decoration. I used a very simple method to get the picture on the t-shirt, the method I used for my anatomical heart t-shirt: I look for the right picture (either on the internet of in a book), get it into photoshop, make it bigger (usually to fit onto A4, a little smaller for the bird), print it, cover those areas of the which I want to trace with tailor's chalk, put the print upside down on the fabric, transferring the chalk and then trace the chalk lines. 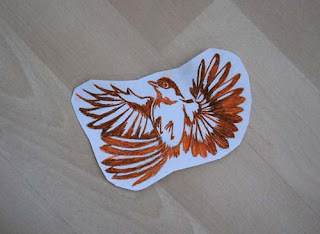 In this case I used white fabric paint and a small brush, the heart was done with fabric marker. I'm not sure about the t-shirt tuck-thing. To wear it over the trousers seems more 'normal' but I think tucked in looks better on me (and who wants 'normal' anyway??). Also, what do you think about my hair in these pictures? It has grown very long (and is in need of a trim) and I've been annoyed with 'only being able to wear it in a ponytail'. It looks impressive when worn loose of course, but in that case, it brushing at least every 30 minutes or so and gets into everything. Today, I made a braid and rolled it into a bun high on the back of my head. It sure is practical and stays up rather well, but how about the look? Ballerina-like and kind of cute? Or just granny-ish and not in a good way? And whatever you think of this, do you have any other suggestions for straight waist-length hair (not too high-maintanance, please)? My main patternmaking textbook is called 'Grondvormen' (which roughly translates as 'basic shapes'). It comes in part 1 and part 2, 1 giving instructions on creating various slopers and their variations for men and women, 2 dealing with 'details' like alternative sleeve shapes and collars. The authors are Dutch, so I am rather convinced that this particular book is only publish in this language. 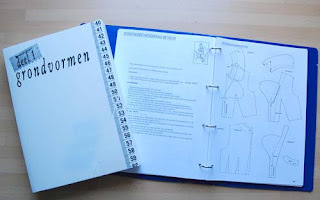 It's not actually ment for the hobby seamstress, rather it's a textbook for teaching patternmaking in the Rundschau method to students at fashion colleges. 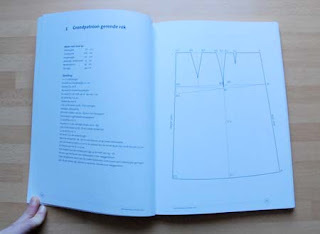 Which is why it makes sense for part 1 to come with fold-out, pre-made slopers in the book's standard sizes (it's women's sizing has been way off for anyone, I've ever measured. They seem to assume a very well defined body shape and small sizes). And it is also why it doesn't have a large section on fit alterations for the individual wearer's figure. The instructions are step-by-step and very clear, however they are rather mathematical in nature. If Winifred Aldrich's metric pattern cutting (which I own as well, the pictures just didn't turn out right, but Melissa made a rather good review of it), gives you a headache, don't even open this book. I mostly use 'metric pattern cutting for womenswear' when drafting separate collar shapes (a simple shirt collar for example) and I tend to prefer this book for sleeve shapes. Aldrich gives more variations for sleeveshapes on fitted bodices. 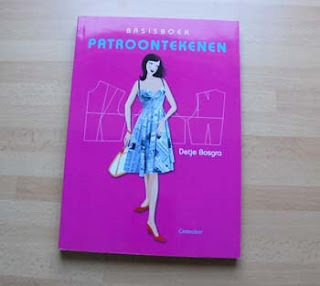 My third patternmaking book is 'Patroontekenen' (='patternmaking') by Detje Bosgra (also a Dutch author, so, as far as I know, a Dutch-only book). I bought this book quite enthousiastically two years ago (now I remember, it was my gift to myself for passing my driving test), and I've only ever used it once or twice. Despite its 'fun' and 'girly' cover, this is not a fun or easy book. Like the other books, there are instructions for slopers, there's some information on tweaking the fit and there are variations. However the instructions are headache-inducing to me. This lady (a teacher in patternmaking) uses technical terms which I recognise, but are not common to me (and I own both other books in Dutch, and did a course in pattern making, so I'm familiar with the common lingo), and she is so economical in the use of words that a lot of the instruction becomes incomprehensible. Good thing you don't need the instructions to make the variations, which, if I remember correctly, were my reason to buy this book. And one note to all would-be pattern makers among you: you can use your own sloper (even just Burdastyle's JJ sloper or one of those sloper dresses some pattern companies used to make) for any variation you find in another book. 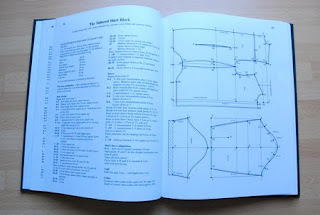 Just pay attention to what kind of base is used, this book has a lot of variations for to-the-waist bodices and some others use 'easy fit' blocks quite a lot. Well, that just about covers my books on womenswear, but as some of you may know, I make shirts for my boyfriend. And sometimes for my brother as well. Of course, I could use a shirt pattern by Burda or Vogue (and for my brother, I do just that because his shirts, all three of them were spur-of-the-moment gifts), but why do that, if I could make my own pattern? 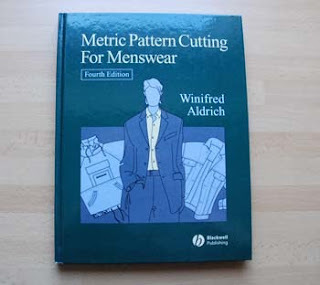 Enter Winifred Aldrich's 'Metric pattern cutting for menswear'. Oh, by the way, I love the fact that these books are using metric measures, inches tend to confuse me. This book offers no less than three different shirt blocks, easy fit, classic and tailored. I tried them all and found out that the tailored shirt block is best suited to E's athletic shape. I have made several shirts (about 8?) for him, and he's kind of hooked on that fit now, so even more will follow. The book also offers basic shapes and variations on all other kinds of menswear and I've used some of those as well (although I'm not quite sure whether I've used the trouser block from this book or from Grondvormen). There's one curious thing though. In womenswear, even when instructions for separate blocks are given, it generally accepted that all shapes for tops can be made from the basic, (fairly) fitted sloper. No such thing exists in menswear. Shirt, vest and jacket each come with their very separate sets of instructions, not to mention the much flatter shapes for casual wear. In a certain way, you get less freedom and less control as a designer and pattern maker. I realise there will be some kind of historical explanation for this, something to do with the age-old separation between tailoring and dressmaking... I'll get back to you as soon as I have a real working theory. I finished miss V's dress! It's not the greatest picture (I made it a bit lighter to show the details), but she's nowhere near my size and don't feel like padding out the chest of my dressmaker's dummy for just one picture. In fact it's a fairly simple dress: armhole princess seams, buttoned faux surplice center front panel, skirt with pleats at the center front and back panels. It is made from black cotton twill with a bit of stretch and closes with a blind zipper at the side. It will have long, bare shoulder sleeves with fingerloops, made from lycra netting, when it is really finished. V and I agreed it would be better to fit those directly on her arms once the dress was finished (but when that happens, I'll try to put the sleeves in and finish them straight away, and the dress will go home with her). I made this dress at her request, and based on her design. This was the original drawing. I may have made it a bit more 'standard' in looks, but I think I had to. After all, I had to deal with things like human anatomy when going from sketch to garment. I enjoyed the challenge of drafting for and fitting to such a different body shape. Although, I'm glad I decided to fit not just the sloper but also a muslin for this dress on her. I will get yet more practice at fitting different shapes because next up (as in next serious project, I bet I will do a couple of simple spring-things for myself in between) will be a suit for my friend R (last year in early autumn, when wasn't busy, I persuaded her to let me make her a suit, we fitted slopers and muslins, but we only picked out fabric last month and she lost a lot of weight in the mean time, so there will be more fitting to be done first). 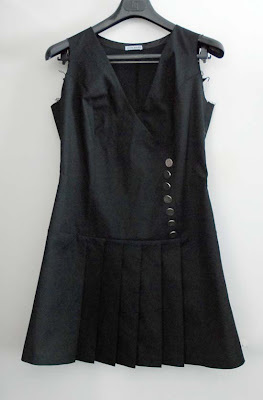 In this post, I told you I was making a dress for a friend. By now, the pattern is ready, the fabric and notions have been found, all the pieces have been cut out and so, it's ready to go. However, the dress was only half of the assignment I got from her. The other half was a corset. Specifically, she wanted an underbust corset she could wear comfortably all day, even say, to work. One without real waist reduction. You'd think such 'dress corsets' are for sale in abundance and that would be true, but than there would be fitting issues. V happens to be a rather well endowed lady and manufacturers of ready-to-wear corsetry (or any RTW clothing for that matter) usually design for 'average' cup sizes (usually a B cup. 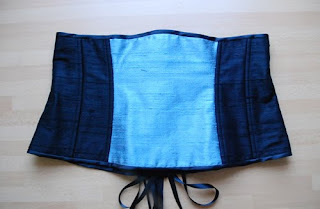 In fact corsetiers are a bit better than clothing companies, they usually make several overbust styles, some specifically for larger cup sizes). Not a problem for an underbust style, you think? Well, think again. Larger busts occupy more territory on one's torso, not just in width, but also in height. Simply said, even on a fairly young lady who has always worn great bras, not allowing gravity to get a hold of her 'girls', a large cup size will mean that the under-the-bust line will be quite a bit lower on the ribcage than it would be for a B cup. and take care where your bones are). For anyone wanting to try and make a corset: there are several brands offering patterns (among others Simplicity, Laughing moon and Truly Victorian) and for those of you who can read German, this website offers several how-to's. And I recently discovered this site, which is connected to this blog. Now, there is an absolute treasure trove which I haven't really explored for myself yet. When I had made a well fitting pattern for miss V, I changed the panels for a more interesting and flattering look. The final product is made from raw silk over two layers of fairly thin but very sturdy black cotton. I used spiral steel boning throughout and flat steel bones along the grommets. V didn't want a busk (front closure). I put the bones in the flat felled seams, without using boning tape. I think that is Ok in this case because this corset will not be worn under any great pressure. I usually hate putting grommets into anything, but these came with one of those little tools which actually worked. 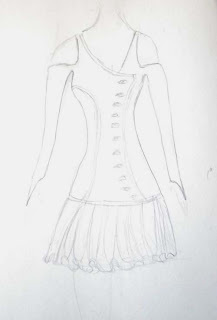 I hope V will be happy with the corset, and now, I'm of to work on her dress! For a while now, I've endulged in the habit of checking out the stalls, selling second hand clothing and accesoiries, whenever I visit my local market (and the market in The Hague is a big thing, open for business four days a week). Usually, I don't buy anything, or just leather clothes to refashion into bags. Lately however, at another stall, I've found some things I just couldn't leave there. First up, two weeks ago, I found this dress. I misses a button and although it didn't have a tag, I knew it would be big for me... But those details! The inside betrays it was hand/home made, it's made from is lovely cherry pink wool crepe with a matching lining. Handmade covered buttons with tiny sew-on snaps between them, to keep the gaps closed. Immaculate bound buttonholes with very narrow welts... And did I tell you it was on the '1 euro' rack? Probably because of the missing button. At home, I put it on anyway. I found to my surprise that although the lady for whom this dress was made must have had a fuller figure than yours truly, she must also have had about the exact same height and frame. Bust darts and waist shaping are all in the right place for me, and the shoulders (a lovely half-raglan shape) are only a bit wide, no doubt owing to the overall size difference. So I thought that maybe, if I wear it with a contrasting belt... It's not the greatest picture, but what do you think? At the same visit, I also found this handbag. 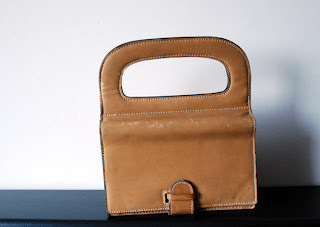 Small, slightly dented, great shape, thick beige leather on the outside, black plastic inside, ingeneous closure, same at front and back and 4 euros. The look seems 60's to me but it has no tag and I know there were loads of futuristically shaped bags in the 50's already and there have been revival styles ever since. I just had to buy that too. Now, this week, I was at the stall again and I fear the seller, a very nice lady of about 60 years old, may be on to my great weakness: I will buy anything which has great vintage-y details and costs 5 euros or less. This coat caught my eye because of its great seaming. It didn't photograph well, but I'll discribe it to you: the sleeves are set-in at front, but cut-on at the back, the seams in which the pockets are, are in fact the only ones in the entire coat, branching out to meet the set-in sleeve and to form a bust dart. On closer inspection, it also had these great buttonholes. Yep, those are blind bound buttonholes, with bound slits to help you use them. It turned out to cost 5 euros. It is a bit big on me and looks rather austere. On the other hand, don't you think it reminds one of those classic Balenciaga 'barrel' coats? I had seen this hat before, but I had restrained myself and had not asked for its price. Now I did. It was 5 euros. It's a black straw hat with black ribbon. To me, the shape seems 50's, but again, I may be wrong. It's fairly small, but I think it was meant to be worn like this, high on one's head. I may never wear this baby, but I just love it. Yesterday, I promised you a post about stuff I made when I wasn't posting. Well here it is. It's not a huge amount but I have been busy with other things and with 'assignments' from two friends, which require fittings. The good thing however, is that the things I made for myself over the past two weeks all go well together. sewing/pattern making class almost two years ago. There was just 1 meter of it. For these trousers, I dropped the waistline a bit (to be able to fit it onto the fabric and to try out the somewhat sloughy look I've been seeing in magazines for this kind of trousers). I also made the pockets deeper (the only flaw on the other pair, in my opinion, were the too high scoop pockets) and adjusted the top part with the pleats to the new waistband. I also tapered the leg more towards the knee. In the first pair, it's just a straight line from hip to ankle. The fabric is very comfortable to wear, but was extremely annoying to sew. I didn't make bound pockets at the back because I really didn't trust that set up with all the stretch. The t-shirt is something of a crazy experiment. I bought the fabric on sale at the market. Thin, not very stretchy cotton knit in a burgundy/aubergine colour. And about 3 meters of it. So it is ideal for experiments. This shirt has the sleeves and upper back cut in one piece, in a way which I have seen a lot in knitting patterns for shrugs but nowhere else. As I have stated before, I'm slowly getting into experimenting with roomier shapes, but I like to tweek them to flatter my shape. Being rather flat-chested means that a lot of the wide kimono-sleeve stuff, avaible for the past seasons, is not for me. My solution here is to have shirt wide down to the waist. Not lower. I think this shirt turned out to be a fun shape. Of course, I pull it up when I lift my arms, and it doesn't go with everything, but still, I think I'm happy with it. I have yet to wear it out though (it's not warm enough yet). The third thing I made is another tiny shrug (I also made one as a present for my sister, two weeks ago). I still want to make a long sleeved version, but this was another case of severe fabric constraints. I actually made this one with a shoulder seam, just to be able to get it out of a scrap. This fabric, a black knit with silver lurex threads in it, was part of a large bag of fairly big scraps thrown out by a local artist/fashion designer M knows. I can never pass up free fabric, so I sorted through the bag and took this stuff, among other things (including several bits of jersey suitable for lingerie, or it's muslins and linings). So far so good. I've got loads of ideas but the in-between wheather makes it hard to decide on what to make NOW.